The Ostroy Report: Is the Hezbollah Threat to Attack on U.S. Soil Real? Is the Hezbollah Threat to Attack on U.S. Soil Real? Citing terror cells with thousands of operatives that could be mobilized quickly, Hassan Nasrallah, head of the Hezbollah terror organization which Israel is at war with in Lebanon, issued a grave warning this week that it would strike against America on U.S. soil. 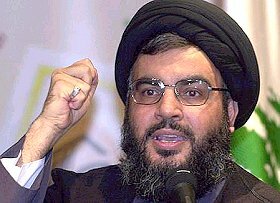 This is the same Nasrallah committed to the destruction of Israel, and who makes statements such as "If they [Jews] all gather in Israel, it will save us the trouble of going after them worldwide" (10/22/02) . But is this threat real? Do Americans need to fear suicide attacks here at home from Hezbollah? It should be strongly noted that Hezbollah is no stranger to violence against America. In October 1983, a Hezbollah truck bomb killed 241 American Marines at the multinational force barracks in Beirut, Lebanon. The following year, a suicide bombing at the U.S. embassy in Beirut killed 17 Americans. Hezbollah is also responsible for the 1985 hijacking of TWA flight 847, during which one American was killed, and the 1996 Khobar Towers bombing in Saudi Arabia, which killed 19 U.S. servicemen. Hezbollah also maintains a network of cells in the U.S., according to the FBI. testifying before Congress in September 2002, then-Deputy Secretary of State Richard Armitage warned that Hezbollah's capability to organize an attack on U.S. soil was similar to that of Al Qaeda. Hezbollah cells have been broken up in North Carolina and Detroit, although to-date, Hezbollah's activities inside the U.S. have been limited to fundraising. But the overall threat is certainly real enough. The U.S. designated Hezbollah as a foreign terrorist organization in 1997, and in 2001 gave it Specially Designated Global Terrorist status. The Department of Homeland Security and the FBI issued a joint statement this week which warns local police that "Individuals residing here who sympathize with Lebanon or Hezbollah could act on their grievances too." And FBI Director Robert Mueller said, "To the extent that we have identified individuals associated with Hezbollah, we are taking additional precautions to assure that we do not face any threat from these individuals." Reassuring? Hardly. First off, the Busheviks have a horrible track record with honesty. Are we to truly believe anything this administration tells us? Can we take any comfort whatsoever in assurances from them that we're secure here at home from a Hezbollah attack? Next, this administration is also incredibly inept. Despite pre-9/11 warnings from both Al Qaeda and from terror experts such as Richard Clarke, the Busheviks left us wide open to terrorist attack. We were woefully unprepared then, and who's to say we're truly any better off now? Regardless of how they may be downplaying the threat from Hezbollah, just as they had pre-9/11 Al Qaeda, the Busheviks are clearly alarmed enough to have placed them on the radar screen. Let's just hope they're truly watching. Clinton, Sandy Berger, and Richard Clarke blocked at least 4 attempts to kill or capture Osama Bin Laden. (see 9/11 commission report). Your claim that Bush downplayed Al Qaeda is ridiculous since he only had 7 months to clean up after Clintons 8 years of ignoring terrorist threats. Most of the 9/11 terrorists were in the country by the time Bush even became president, and it would have taken civil rights abuses to catch the terrorists. The Able Danger program highlighted at least 4 of the 9/11 terrorists and Clinton's administration went as far as putting post-its over the faces of the terrorists because they wanted to ignore them. Needless to say, Thank God Republicans are protecting this country, because everybody knows that the spineless jellyfish on the left couldn't protect this country from any threat. You never know, Madeline Half-Bright might have attempted to give food, fuel, and nuclear technology to Hezbollah, just like she did to North Korea. I can't see why Bush would be assuring us we have no threat since it would be to his advantage and Israel's to instill fear in Americans so they will support this slaughter to eradicate Hezbollah. The truth of no danger must be getting past him. I heard a number of authorities on TV lately all saying Hezbollah is much too occupied to spread destruction here. And, those of their organization caught here have never attempted anything but fund raising.